“Translating” a video game to anime is always risky business because the experience cannot but be different. In the first place, players with a given video game generally have a wide number of choices, or at least a few highly critical ones, which shape the direction of the ending. Directors therefore must choose one option, stick to it, and try to make the viewing public like it. Full disclaimer: I have not played the game. I have heard complaints from those who have, though. 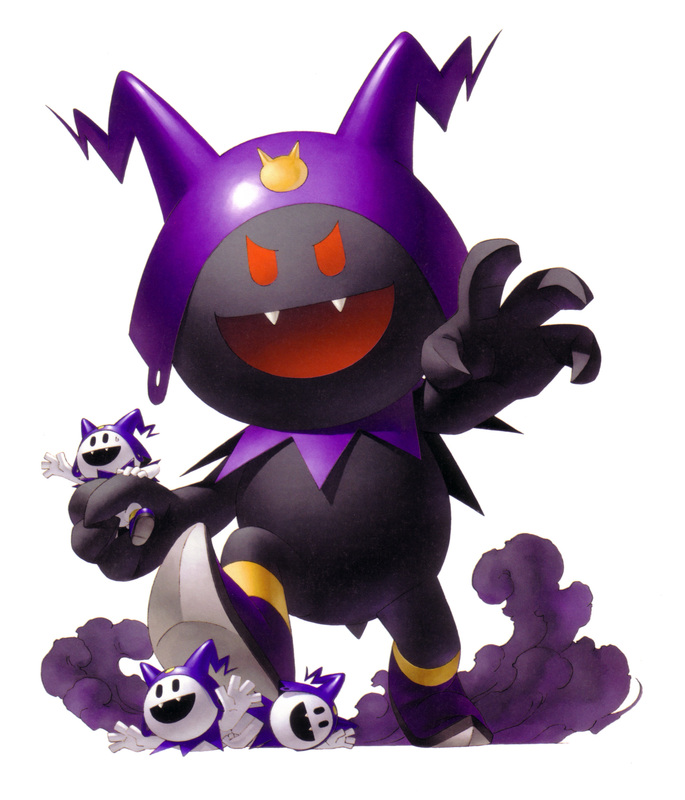 Essentially a narrative is shaped, filled with fixtures of the Shin Megami Tensei game series such as “demonic” beings summoned by humans, such as the Godzilla-sized, “evil” version of the cutsey series mascot, called (in English) Black Frost, whose picture graces the top of this post. Such is the symbiotic supernatural power that is used to combat the “monsters” that assail humanity, part of a trial by a being/ system that views humanity as unworthy of continued existence. The real conflict is still man vs. man, between one iron-willed individual who thinks that humanity as it stands now truly isn’t worthy of continued existence, and Hibiki, who wants to save not just the world, but also Yamato, the strong-willed individual in question who tries to take the whole world on his shoulders (even as it is consumed by the void). I found the show to be tolerable because the varied core characters were mainly worth watching, and because the high powered battles were, broadly speaking, done well with a lot of action. Thirteen episodes wasn’t enough time to slow things down and take one’s time. While I’m not as big a fan of the mouthpieced philosophical debate at work – you shouldn’t have to try this hard to justify stopping global universal genocide – my bottom line is, the protagonist and antagonist are both well-acted (so to speak) and carry their crosses convincingly. You don’t have to agree with both of them – or either of them – to take away the sense that the characters believe what they’re saying and believe that they’re right. Any show that can’t produce a credible conflict is difficult to watch, and this show does have a conflict, and does resolve it. That’s important. I would not nominate this show for true greatness, so I’ll give it a 7 out of 10 with a nod to the animation and song work, but as much as I think the character designs were mostly outstanding, this is a conflict that has been done before and which was handled in a way that feels heartfelt to the main character (at least), but certainly not original. There are also minor characters who were “weakly acted” and deficiencies in the writing, but hey, video game adaptations are hard, and decency is something we should be grateful for. I enjoyed my time and that is that. This entry was posted in Anime, Japan and tagged animation, anime, devil, review, SMT, survivor. Bookmark the permalink.